Moroccan Berber carpets are unique and have a fascinating history as one of the most celebrated folk art rug styles. Moroccan Berber Rugs have been in continuous manufacture since the seventh century A.D. From the very first example, the weaving of Moroccan Berber Rugs was the responsibility of the Berber women. Berber women were responsible for keeping and passing down the knowledge that went into making theses rugs, including secrets of family patterns, looping techniques, and the colors that should be used. All of this knowledge was passed down matrilineally, with each subsequent generation of girls being responsible for passing it on to the next. Berber carpets were used within tribal groups as blankets, horse covers, and a wide array of other utilities. Over the centuries, Moroccan Berber Rugs gradually evolved. Eventually, demand for such carpets began to come from outside of Morocco. Moroccan Berber Rugs began to be seen as especially good gifts, with fine examples being placed in palaces and important sites throughout Europe and the Near East. Still more time passed, and, soon, Berber carpets were exceptionally popular wherever they could be found. The current renewed interest in mid-century modern works of art has returned vintage Berber carpets and Moroccan rugs to the forefront of the rug world once again, with the Moroccan shag rug style enjoying popularity. Today, vintage Berber carpets are among the more popular style of vintage rugs on the market. Moroccan Berber Rugs, conceived of and woven by the Beni Ourain tribes-people of the Atlas Mountains, are one of the great cultural contributions Morocco has given to the world. These unique and beautiful works of art, with their exciting, energetic and enigmatic compositions entice us just as much today as they have enticed consumers for centuries. The all natural process that results in Moroccan Berber Rugs rugs utilizes local sheep’s wool and local vegetable dyes – making such pieces inherently Eco-friendly. Berber rugs and carpets from Morocco are part of North Africa’s famous ethnic tribe weaving. The Moroccan Berber rugs are among the most prestigious modernist and folk art rugs in the world. Woven from luxurious hand-spun wool, Berber rugs feature bold designs and incomparable textures. The Atlas and rugged, remote peaks of Morocco are home to a tenacious ethnic group known as the Berbers. Now more than 25 million strong, the Berbers represent dozens of distinctive tribes. Even the renowned Beni Ourain group represents more than one dozen smaller tribes (about 17 of them) that each has its own symbolic dialect and weaving style. Mid-century Moroccan Berber carpets are as unique and individual as the weavers who created them. The colors, patterns and woven designs are inextricably linked to the isolated villages where they originate. In the Middle Atlas region, weavers create an amazing variety of geometric patterns, symbolic figures and plain weave stripes. Berber rugs represent a complete repertoire of Moroccan rug styles that includes flat-weave Moroccan kilims, plush shag carpets, colorful fleecy carpets and posh monochromatic rugs decorated with minimalist designs and abstract patterns. The stunning Berber rugs of North Africa are as popular today as they were during the mid-20th century when elite European designers first discovered their alluring beauty. In addition, the older and vintage carpets that were made by the Berber tribes people are still considerably less expensive than almost any other type of carpet – even those that are new and contemporary! This makes them great decorative carpets that could be purchased and appreciated by people from all walks of life. Nothing could accent a high-end luxury home as well as vintage Berber carpets. The history of these vintage rugs and antique rugs dates them back to 622 AD. 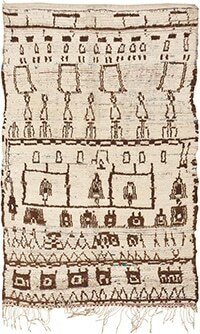 At that time Berber women were taught their familial patterns, looping techniques, and color ranges from the time they were just small girls watching their mothers, and grandmothers weave the intricately designed carpets that would be used for domestic uses like bedding. Some of the vintage Berber carpets were made by professional master weavers from Eastern tribes that were given as prized gifts to elite families. The collective name of all the Berber tribes is Beni Ourain and their Berber rugs adorned palaces and many sacred spaces. Some of these rugs were made smaller, so they could be carried as prayer mats. The Moroccan Berber carpets were crafted by hand from sheared wool. The sheep in the Atlas Mountains would have been sheared and then the wool would have been thoroughly cleaned and combed so it could be spun. Some of the sheared wool would be dyed and some of it would be left in the natural colors. Besides the sheared wool of the Atlas mountain sheep, some rugs would be crafted from camel hair. There was a superstition at the time that if the rugs edges were not burned slightly, then evil spirits would be attracted to the carpets. Many master weavers still burn the edges slightly to prevent the bad spirits from being envious of the rugs beauty. You can partially judge where the vintage rugs from Morocco were made by their loops. Rugs with large loops and looser knots were likely to have been woven in the mountainous regions because this design allowed them to protect people from the cold temperatures. Rugs that had finer weaves were usually meant to sleep on top of instead of to keep you warm. 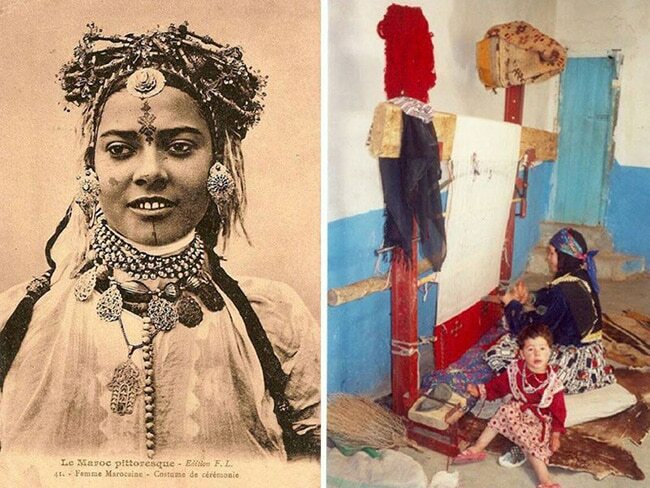 The Southern Berber tribes like the ones in the Jebel Siroua region of Morocco has always been considered to have the most sophisticated weaves. 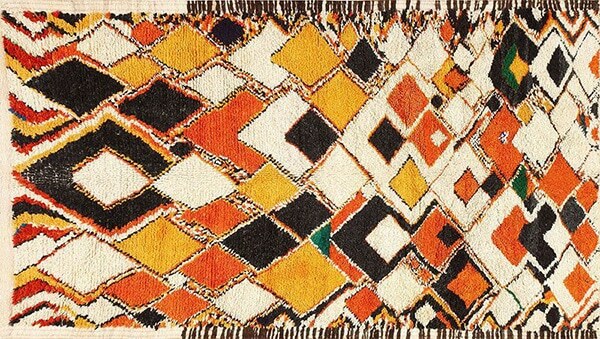 Moroccan rugs and carpets from this region are made with different flat weaves and textile mixes to create unique designs, patterns, and textures. 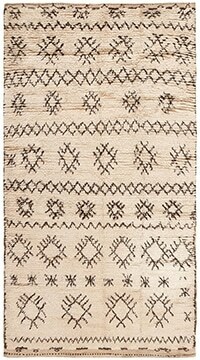 You will find several patterns and designs used in the Berber vintage rugs. The patterns range from bold geometrical designs reminiscent of Islamic artwork to designs that are almost monochrome in appearance. 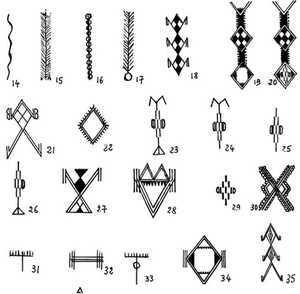 There are weavers who create designs that depict crosses, lozenges, triangles and simple shapes like diamonds. The traditional rug colors start in white, brown and black shades of the virgin wool. Saffron would be used to create yellow colors and henna would be used to create red colors. Blue was created from indigo and green was gotten from wild mint, while burgundy was derived from pomegranate. The Berber people believe in the positive energy of Baraka to ward off evil energies or spirits. 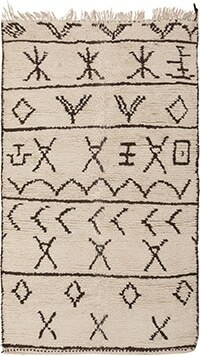 When a vintage Berber rug was crafted, it often has symbols woven into it to infuse protective powers in the carpet. 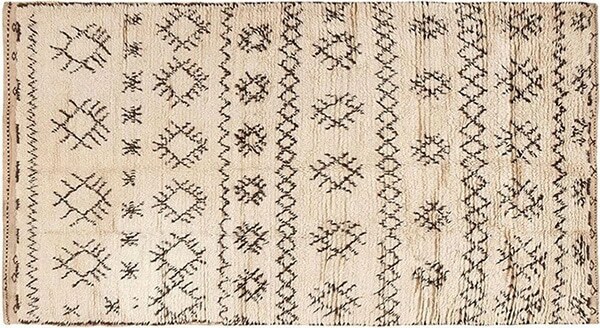 Fertility symbols were often used in rugs being given to newly married couples so their home might be blessed with many children. These vintage Berber rugs for today’s homes reflect the beliefs of the people that made them. The hopes, dreams, wishes, fears, and expectations of the men and women who crafted these items were woven into the threads as they worked. The Moroccan Berber people of North Africa have a long and illustrious tradition of making fine hand-woven rugs and carpets. The Berbers, who also call themselves Amazigh, or Imazighen in plural form, are descended from pre-Arab inhabitants of North Africa who are known to have lived in the region since prehistoric times. Today, they are found in scattered communities across much of the region, including Morocco, Algeria, Libya, Tunisia, Niger, Mali and Mauretania. Having one of the largest Berber populations, Morocco is among the most prolific producers of Berber carpets today. Each of the about forty-five Berber tribes scattered across the country has its own distinctive design as well as weaving and embroidery style. However, all the different carpets of the different tribes share two common characteristics: simplicity of design and richness of colors, especially red and saffron. Traditionally, Moroccan Berber carpets have been woven more for their utilitarian purpose than as decorative pieces. The carpets made by Berber tribes that live in the Atlas Mountains region are thick with a heavy pile, whereas those made by tribes that live in the desert are light and flat woven. The Berbers and other nomadic Moroccans use the carpets variously as bed coverings, sleeping mats, burial shrouds, saddle blankets and for self-adornments. The history of Moroccan Berber carpets can be traced back to the Paleolithic era, a prehistoric period characterized by the development of the first tools used by man. Traces of Berber motifs and tribal symbolism have been found in rock arts and cave painting dating back thousands of years. In the absence of written language, the weavers of ancient times recorded their myths and legends through glyphs and markings embedded in their carpets. Through the centuries, the ancient land of the Berbers has been invaded and colonized by a series of empires that rose and fell with time, including the Romans, Ottomans and Arabs. None of them managed to leave a more lasting impact than the Arabs, who successfully Islamized the entire region and gave the region an Arab identity. However, the Berbers held tenaciously to their unique design, mainly because they had been isolated for thousands of years before the invaders arrived. Berber carpets from the 20th Century have the same transference of glyphs and markings that Berber carpets in the distant past used to have. The tribal weavers, who neither possess nor seek formal artistic training, continue to tell the same stories of yore, handed down through generations. Thus, looking at a traditional Moroccan Berber carpet feels like looking at a century old carpet persevered in a time capsule. This is their main appeal to Western buyers. 20th Century Moroccan Berber carpets still have the same design characterized by distinct knots, but they usually contain small flecks of dark color on a lighter background. Many of them have a plain color mix with no patterns. Berber Tattoos – Tattooing has a long and complex history in Africa. The Berber tribe, specifically, has been engaged in tattooing symbolic motifs on their bodies for centuries. Berber tattoo motifs range from animal and plant figures, to spiritual and abstract designs. These tattoos were used for many different purposes, but almost all of them are seen as a way to ward off or protect oneself from evil spirits. Berber tattoo designs can be found plentifully on vintage Moroccan rugs. It is the Berber women who weave, passing motifs and weaving techniques from mother to daughter. Traditional Moroccan Berber designs include checks, triangles, zigzags, crosses and stars. Designs are a combination of indigenous motifs, those adapted from Islam and those from other African cultures. The design language identifies the village and lineage of the woman. Motifs symbolize energy, god’s blessings, power, and protection. The spiritual power and protective properties of these symbols is believed to ward off the evil eye.